Authentic Mexican Food in Rhode Island. We are located in the heart of Conimicut village at 750 West Shore Rd. in Warwick and our brand new location in Cranston at 342 Budlong Rd. Our menu features a fusion of Latin American and American Cuisine, made from only the freshest and highest quality ingredients, with something sure to please every member of your group. 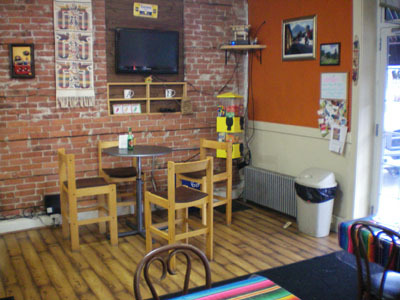 Papis Tacos has established itself as one of the area’s favorite culinary destinations and is sure to offer you a pleasant and unique dining experience. We offer catering, take-out, gift cards and private party bookings. Hard Or Soft Corn Tortilla With Steak, Plus Cheese, Sour Cream, Lettuce, And Tomatoes. Hard Or Soft Corn Tortilla With Carnitas, Plus Cheese, Sour Cream, Lettuce, And Tomatoes. Hard Or Soft Corn Tortilla With Veggie, Plus Cheese, Sour Cream, Lettuce, And Tomatoes. Hard Or Soft Corn Tortilla With Chorico, Plus Cheese, Sour Cream, Lettuce, And Tomatoes. Hard Or Soft Corn Tortilla With Beef, Plus Cheese, Sour Cream, Lettuce, And Tomatoes. Hard Or Soft Corn Tortilla With Chicken, Plus Cheese, Sour Cream, Lettuce, And Tomatoes. Bedded With Lettuce Inside Rice, Beans Cheese, Your Choice Of Meat, Topped With Guacamole, Tomato, Cilantro, Onions, And Sour Cream. Oven Baked Flour Tortilla with Choice of Filling: Chicken, Beef, Steak Carnitas or Chorico Plus Rice, Beans, Cheese, Salsa, Sour Cream, Lettuce, Tomatoes and Guacamole. Fresh, Hot Large Flour Tortilla with choice of filling: Chicken, Beef, Chorico, Veggie, Steak, Carnitas plus Rice, Refried Beans, Cheese, Sour Cream, Lettuce, Tomatoes. Fresh Hot Large Flour Tortilla with Rice, Refried Beans, Cheese, Sour Cream, Lettuce, Tomatoes. Fresh, Hot Large Flour Tortilla with Rice, Black or Refried Beans, Cheese, Sour Cream, Lettuce and Tomatoes. Fresh, Hot Large Flour Tortilla with choice of 2 fillings: Chicken, Beef, Chorico, Veggie, Steak, Carnitas plus Rice, Refried Beans, Cheese, Sour Cream, Lettuce, Tomatoes, and Guacamole. Crispy Corn Tortilla with Chicken plus Cheese, Sour Cream, Lettuce, and Tomatoes. Crispy Corn Tortilla with Beef plus Cheese, Sour Cream, Lettuce, and Tomatoes. Crispy Corn Tortilla with Chorico plus Cheese, Sour Cream, Lettuce, and Tomatoes. Crispy Corn Tortilla with Veggie plus Cheese, Sour Cream, Lettuce, and Tomatoes. Crispy Corn Tortilla with Steak plus Cheese, Sour Cream, Lettuce, and Tomatoes. Crispy Corn Tortilla with Carnitas plus Cheese, Sour Cream, Lettuce, and Tomatoes. 3 Extra Crunchy Corn Taquitos Filled With Chicken Only Plus Lettuce, Sour Cream and Romano Cheese On Top. Fresh Hot Large Flour Tortilla with Shrimp, Onions & Peppers Plus Rice, Refried Beans, Cheese, Sour Cream, Lettuce, Tomatoes. Fresh Hot Large Flour Tortilla with Steak, Onions & Peppers Plus Rice, Refried Beans, Cheese, Sour Cream, Lettuce, Tomatoes. Fresh Hot Large Flour Tortilla with Chicken, Onions & Peppers Plus Rice, Refried Beans, Cheese, Sour Cream, Lettuce, Tomatoes. Grilled Flour Tortilla with lots of cheese, lettuce and sour cream on the side. Crispy Nachos topped with Cheese, Lettuce, Sour Cream, Jalapenos, Tomatoes. Your Choice of Meat: Chicken, Beef, Steak, Carnitas, or Chorico. Crispy Nachos topped with Cheese, Lettuce, Sour Cream, Jalapenos, Tomatoes. Lots of chips, Salsa, Sour Cream, Guacamole, Hot or Mild Sauce upon request. Nachos. Melted Cheese, Lettuce, Tomatoes, Jalapenos, Sour Cream and One Meat. Grilled, Melted Cheese, One Meat, Lettuce, Tomatoes and Sour Cream. Your Choice of Soft or Hard. With Sour Cream, Lettuce, and Parmasian Cheese.